Wednesday night’s Christmas Concert revealed some very talented vocal artist after New Haven High School’s Choir's jaw dropping performance. The evening also included performances by the high school band along with the Middle School’s Band and Choir. New Haven, Mo. – Friday night, between the junior varsity and varsity games, Mariah Williams and Curtis Kotthoff were crowned the 2012 Winter Ball King and Queen in front of a packed house. Pictured Mariah Williams moments after the King and Queen were announced. The junior candidate and newly crowned Queen, Mariah Williams, is the daughter of Charisma and Marques Wright. Mariah is a member of the Pep Squad and Track and Field Team. She enjoys hanging out with all of her wonderful friends, listening to Justin Bieber, and of course, loves shopping. Mariah plans to pursue a career in special education, get married, and start a family in the future. Pictured above is Wyatt Parsons. New Haven, Mo. - Imagine the feeling of being the first student to accomplish something no student in the history of New Haven High School has been able to do. Pictured is Team Princesses, winners of the 2012 Leadership Week. Pictured left to right: Secretary Hannah Kassebaum, Reporter Taylor Skouby, Treasurer Kelesy Peacut, and Vice President Clara Albers. Not pictured is President Rachel Horstman who was ill and unable to attend. New Haven, Mo. – Each year on Nov. 15 Future Business Leaders of America (FBLA) chapters across the United States host activates to promote American enterprise within their schools and communities. Pictured left to right: Ryan Winters with the New Haven Lions Club and Beth Schenck. New Haven, Mo. New Haven High School Counselor Doug Peirick announced on Monday that Beth Schenck, daughter Mike and Amy Schenck of New Haven, has been awarded the 2012 Hugh O'Brian Youth Foundation (HOBY) Leadership Award for New Haven High School. Photo above by Katie Aichholz. Pictured left to right: 2nd place Taylor Skouby (Scooby Doo Pumpkin), 1st place- Megan Bauer (Bambii Pumpkin), 4th place Kierstin Monzyk (Fall Leaves, Acorns, and Deer pumpkin), and 3rd place- Fey Chavez (Batman Pumpkin). Each year New Haven High School’s FCCLA holds a Halloween contest. We stopped by earlier this afternoon and was very impressed with the creativity and ideas that student’s came up with. Below are some of the best costumes we saw. Pictured left to right: Drum Majors Ben Luecke and Meghan Brown. Potosi, Mo. - Saturday was another exciting day for the Marching Shamrocks at the Bi-State Marching Festival. New Haven won nearly every award possible aside from taking first place in their class. Washington, Mo. - Flawless uniforms, perfect lines, their appearance similar to a Marine drill team, and stone cold facial expressions describe the Marching Shamrocks. 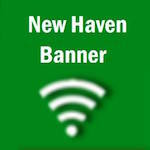 New Haven’s Marching Shamrocks decades of success continued Saturday as they cleaned house for the second stratight week. The senior class does the traditional victory jump into the pool. New Haven, Mo. – Traditions have always been an important aspect of New Haven High School, hence the motto, “A Tradition of Excellence.” I am not referring to the school’s history of success in sports. Pictured on left is Drew Schwentker and right is Ben Luecke. Warrensburg, Mo. – Ben Luecke and Drew Schwentker participated in The American Legion Boys State of Missouri June 16 – 23 on the campus of the University of Central Missouri in Warrensburg. Luecke and Schwenter were selected based on their leadership, citizenship, academics, and character during their junior year at New Haven High School. Abby Menke delivers valedictorian speech at New Haven's High School Graduation ceremony. New Haven, Mo - New Haven High School senior Abigail Menke is this year's recipient of New Haven High School’s oldest privately endowed scholarship: the Scheer Memorial Scholarship. Pictured is Lance Gerlemann, salutatorian, while delivering his speech at New Haven High School 2012 Graduation. Lance Gerlemann, has been honored as New Haven High School’s eighth recipient of the William N. Kelley Family Scholarship for the Class of 2012. New Haven High School Counselor, Doug Peirick, presents Kim Conner, recipient of the $5000 Howard Langeberg Family Scholarship. Kimberlee Conner was the recipient of the 5th annual Howard Langenberg Family Scholarship at the 2012 commencement exercises at New Haven High School. Kim is the daughter of James and Julie Conner of New Haven. New Haven, Mo - New Haven High School’s student of the month for April/May is senior Michael Leath. Leath is the son of Ernie and Jenny Leath. Leath was recognized for his hard work and effort both in the classroom and extra-curricular activites. New Haven, Mo - After 31 years of teaching at New Haven High School, Rhonda Helling has submitted her letter of resignation to the Superintendent of the New Haven School District. Kim Conner was the recipient of this year's Ty Quick Athletic Memorial Scholarship. The Ty Quick Athletic Memorial Scholarship was established in the memory of Ty Quick after he was tragically killed in a car accident on August 6, 2005. Kim Connor pictured with Curtis Boyer, awarding Boyer's Agency 2nd annual five hundred dollar scholarship.